Being a stay at home mom, I am always looking for tips and tricks to help save money at the grocery store. Sometimes it can be a little difficult to budget since we do only have one income for our household. 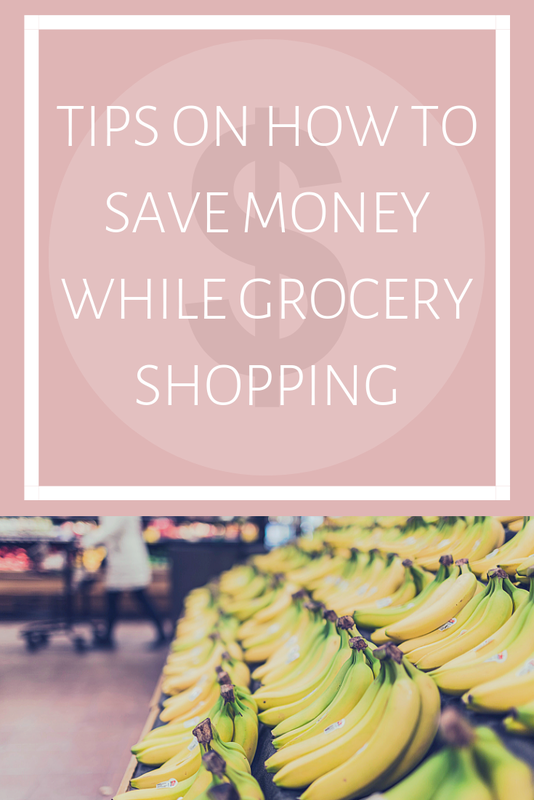 So today I thought I would share with you some of my tips and tricks to help save money while grocery shopping. I found that these work really well for my family and I and I hope you can get some use out of them as well! If you are someone who doesn't make a grocery list, you really should! Each time we go grocery shopping I always make a list. Make sure you go through everything in your cupboard first to see if you have any products that can be used in your meals for the week. That way you are using up things you have at home first before going out and buying a much more food. I always go through my fridge, freezer, cupboard and my stock pile in the laundry room. I base my meals on what I have at home already and what items I need to finish up a meal. On my list I always right down what is on the menu for the week and then go from there. If you go to the store without a list, you will end up buying a bunch of things you truly do not need. Based on what is on your grocery list, set a limit on how much you want to spend. If you are buying groceries that include a lot of meat, your budget may have to be set a little higher since meat is usually more expensive. Have either a calculator or your phone out to help keep track of how much you are spending. Once you have your list done of what items you need, see if you have any coupons you can use. Coupons.com has free coupons you can print and you can also find free coupons on the P&G website as well. I always try to find at least one or two coupons to use per trip. And sometimes I can even get free items as well. We do our grocery shopping on Sunday's when all of the new ads come out. Compare prices are your favorite stores and see which store has the best deals. If one store has meat on sale and another has your paper products on sale, its totally fine to go to both stores! I am all for finding the BEST deals, so if a store right next to each other have different deals, I will go to both. I created a whole blog post on my favorite money saving apps that you can check out here. I highly recommend checking that post out because I go into a lot of detail on how the apps work and why they are my favorite. Also, be sure to see if the store that you are shopping at has an app. We shop a lot at Meijer for groceries and they have an app you can use to save money. It comes with coupons and each time you purchase something, it go towards your goal where you can get money off your next purchase. So always make sure to check to see if a specific store has an app. I highly recommend downloading the Target app as well so you can use the Cartwheel. Do not go grocery shopping while hungry. You will end up buying so much food and spending a lot more money. We always make sure to eat breakfast or lunch before we head out. Only plan to go to the store once a week. If you follow your list and get everything you need for the week, you won't have to go back out. But if you don't make a list, more then likely you will have to take more trips to the store and you will end up spending more money in the long run. So just try sticking going to the store once a week. I really hope you found this post helpful! Please let me know if you would like some other money saving tips for other things besides groceries! I have learned a lot the last couple of years with being a stay at home mom.